I have a massive problem when it comes to concealer. Not a single one seems to work on me! Either it's too light, or too dark ... too cakey, or too dry. No matter which brand or form I try, it just never seems to work out. That is, until I discovered the Urban Decay 24/7 Concealer Pencil. This baby does the trick every time I need to cover something up, whether it's a god-forsaken pimple, a bit too much redness or even dark under-eye circles. What I love most about this product is the blendability. It comes in a stick form, but it's a chubby pencil that really blends into the skin remarkably well. I've been using it in one of the lighter shades, which is the absolute perfect shade for my extremely pale complexion. It disappears instantly, never making it look like I'm wearing concealer at all -- yet at the same time it hides each and every imperfection! But for gals with different complexions than mine, it comes in eight different hues! And since it's formulated with Vitamin E, it moisturizes and conditions while providing ample coverage. Urban Decay even added in a new ingredient called Microsponge, which works to absorb excess oil and prevent future breakouts! Not too shabby, right? 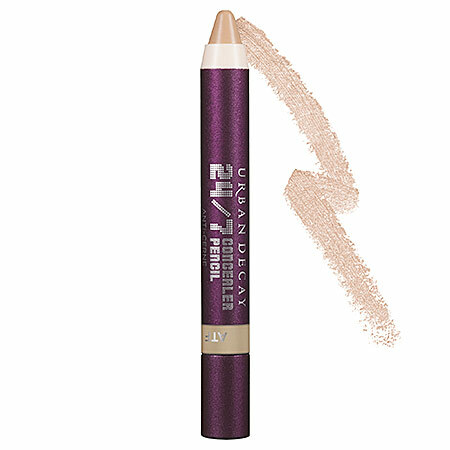 Urban Decay 24/7 Concealer Pencil retails for $19 at sephora.com. I'll definitely have to try this out. Does it come in any lighter shades, or is the one you're using pretty light? I usually go for the extra-light (translucent?) shades. Ageless Beauty -- It comes in four shades. Light is the lightest. The rest are listed in the post! This sounds like something I would actually try! I have had the same issue with all my concealers. I'm currently using Erase Paste by Benefit but as I rub it in with my finger it just seems to move around but not completely cover. Have you ever tried that one? Kate -- I haven't tried Erase Paste, because I saw a lot of negative reviews. I tested it briefly at Sephora but thought the consistency was too chalky and thick. You'll have to let me know what you think of the Urban Decay! I agree! I have it in the lightest shade and even use it when I'm home wearing no other makeup. I have to sharpen it carefully because the concealer is a little soft, but, I still love it and will buy it again. Isn't it wonderful? I don't even really wear concealer, but I make an exception for this amazing one!